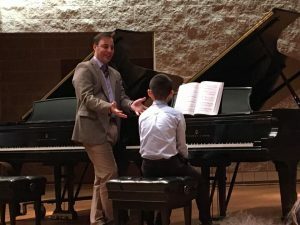 Dr. Kevin Olson presented two full sessions, as well as an intermediate piano and composition masterclass. 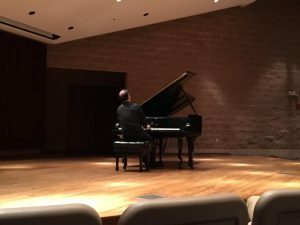 Dr. Olson is a faculty member at Utah State University, as well as a widely respected pianist, composer, and educator. 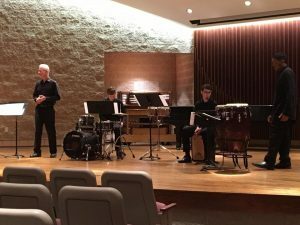 Dr. Marc Wooldridge, currently a professor of percussion and music theory at Indiana Wesleyan University, premiered a new composition “Cyclic Variations” for percussion ensemble. 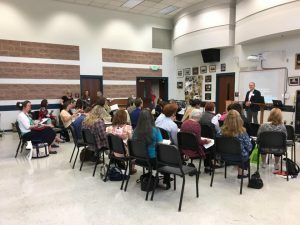 For more information on the composer commissioning program, visit this page. 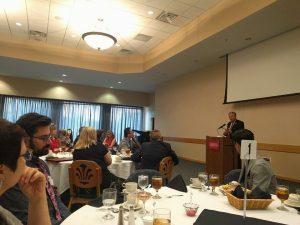 Dr. David Wright, President of Indiana Wesleyan University delivered the keynote address during the Friday evening banquet. 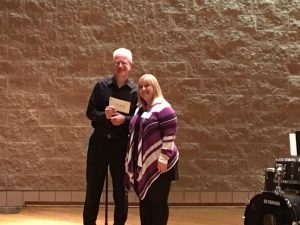 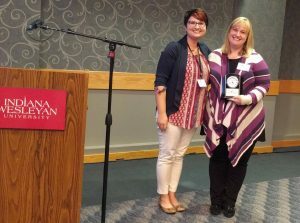 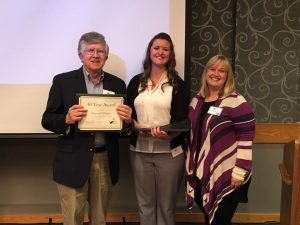 Euni Rickey, a retired professor from Indiana Wesleyan University was awarded 2017 Teacher of the Year. 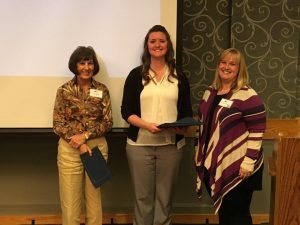 Here she is pictured with former Teacher of the Year recipients Jim Helton (2016), Lori Rhoden (2010), and Juliana Lockman (2014). 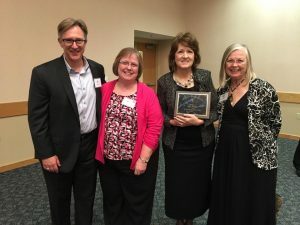 For more information on the Teacher-of-the-Year Award, visit this page. 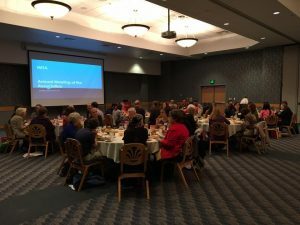 Our annual membership meeting is held during the Saturday luncheon. 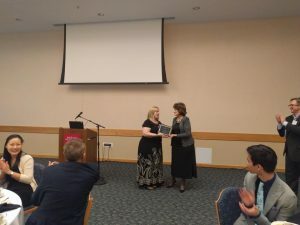 Members were honored for their years of service at 25, 30, 35, 40, 45 years. 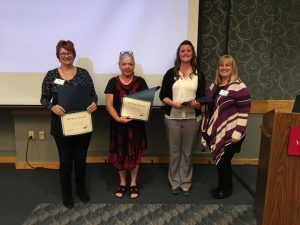 We also honored our outgoing President, Christina Whitlock, welcomed incoming President Amy Chaplin, and approved officers for the 2017-2019 year including President-Elect DJ Smith, VP of Local Associations Ellen Bulow, and VP of Membership Erica Ogden. 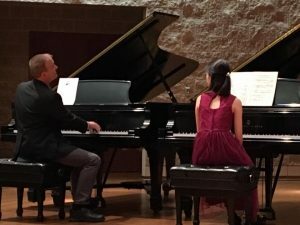 Students who were winners in last years Opus Composition Festival and Hoosier Auditions performed in the winner’s recital to close out the conference. 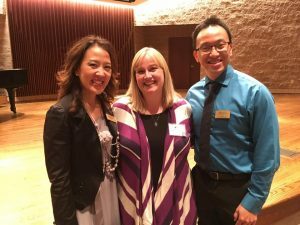 Many thanks go to our conference committee who included Co-Chairs Phoenix Park-Kim and Daniel Lin from Indiana Wesleyan University, IMTA Conference Liaison DJ Smith (not pictured), IMTA President Christina Whitlock, and IMTA President-Elect Amy Chaplin (not pictured). 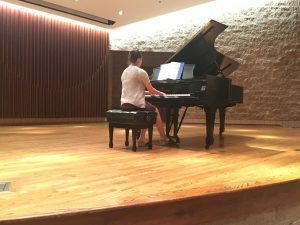 Posted in Conference, Hoosier Auditions, Opus Composition Festival, Professional Development, Teacher of the Year.